Irini Soufis joined LALIVE in 2018. She specialises in litigation and has experience in debt recovery and insolvency proceedings as well as in regulatory and compliance. Irini Soufis is a member of the Zurich Bar Association (ZAV) and the Swiss Bar Association (SAV). 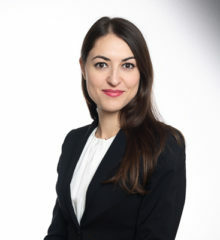 Before joining LALIVE, Irini Soufis worked as a Compliance Officer at one of Switzerland’s largest banks and trained with a leading law firm in Zurich. Irini Soufis studied law at the University of Zurich (MLaw 2013 and BLaw 2012).